Around The Office- July 2015 | Rocco & Associates Wealth Management, Inc.
Brandon joined Rocco & Associates as our Financial Operations Intern for the summer of 2015. He is originally from Palm Beach Gardens, Florida and is an avid boater. Brandon is majoring in Finance and minoring in both Accounting and Economics at the Fairfield University Charles F. Dolan School of Business. He aspires to obtain his MBA in Finance and eventually work within the Wealth Management industry. Prior to interning at Rocco & Associates, he gained experience working within a small family owned and operated asset management firm. During his spare time, Brandon enjoys playing tennis, riding his bike, reading the Wall Street Journal, and spending time with friends. Be sure to say hi to Brandon next time you are in the office! Did you know that Rocco & Associates is active on a daily basis on our social media accounts including LinkedIn, Facebook and Twitter? With the addition of two interns to our team this past semester, we have been able to increase the level and quality of the content across these popular social media sites. We continue to try and push out a nice mix of both financial and other content. If there are certain topics that you would like to see, we would welcome any and all feedback. If you have a moment, please email [email protected] what you enjoy about our social media posts and how we can improve them. As always, we encourage you to share with friends and family! 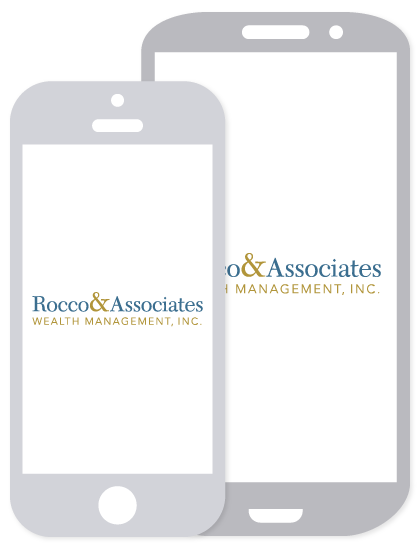 Over the past three years there have been many new and exciting things happening at Rocco & Associates. We have streamlined communications, reduced our carbon footprint by moving to a paperless office environment and rolled out new investment strategies to assist our clients. Each and every one of our clients has varying needs when it comes to planning their financial future. The only client prerequisite we have is that the individual or family has a desire to put the financial lives in order. We have developed programs that leverage cutting edge technology to assist you by offering financial guidance, helping with budgeting, analyzing your insurance plan, and even giving advice on your qualified retirement plan at your workplace. If you or someone you know is just starting out when it comes to needing financial advice we can help! Give the office a call today to find out more. At Rocco & Associates we take pride in immersing ourselves into the local community. Having been in town for over 40 years, we have seen the Fairfield economy grow and continue to support other local businesses in town. This month the team participated in two events that were sponsored by the Fairfield Chamber of Commerce. Charlie headed off to Harbor Yard on June 9th to network with other local business leaders while taking a few swings on the baseball diamond. The Bridgeport Bluefish provided bats and balls while Chamber members alternated pitching to their peers. On June 11th, Eric attended the Annual Chamber Meeting and Awards Dinner where the Fairfield Theater Company (FTC) was awarded the town’s Company of the Year. Eric was also fortunate enough to hear from Catherine Smith, the Commissioner of the Connecticut Department of Community and Economic Development. She spoke about the trends in companies moving to the state as well as some of the challenges from a cost perspective. It is very important to us as a firm to stay abreast of events both locally and at the state level and how they could potentially impact our business and our clients. Do you enjoy hearing about what is going on in and around our office? You can stay connected every day through our social media channels below…like…share…tweet today!